Adam Rainer is the only person in recorded history to have been both a dwarf and a giant. Adam Rainer was born in 1899 and up to the age of 21 was extremely small, thin and very weak. At the age of 19 Adam was medically tested to join the army, but he was too short and weak to do so. During this test his height was measured at 143cm (14’8.3″), which is a typical height for a dwarf, yet in 1920 an excessive growthspurt started (also known as giantism) and Adams height reached more than 233 cm. Adam died in 1950 following multiple health complications caused by his sudden growth. 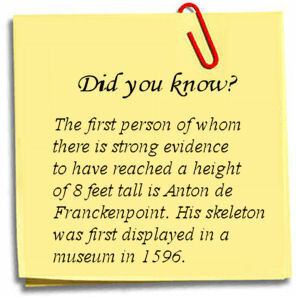 By then he had reached a height of 7’8″ (233.7 cm) or even 7’10” (238.8 cm) according to newspaper articles after his death. When Adam was 18 and 19 years of age (1917 and 1918) he was medically tested to join the army, but he was too short and weak to join. During these tests his height was measured at 4 feet 6.3 inches (138 cm) at 18 years and 4 feet 8.3 inches (143 cm) at 19 years of age. In the report it was written that although the extremely small stature, the patient had extremely large feet. According to Adam Rainer, his shoesize at 18 years old was European size 43 (138 cm in height!). In 1920 (21 years of age) an excessive growthspurt started. His hands and feet started to become of giant proportions. His shoesize was then 53. Towards the end of the 1920’s Adam’s eyesight started to deteriorate. Although still able to read, in his right eye he had become nearly blind. During the same time his hearing became worse, soon being deaf in his left ear. In 1925 and 1926 a spinal curvature started to become visible. From 1925 onwards Adam’s health weakened. Having a normal to good appetite until then, he found it increasingly difficult to eat. Walking started to become more difficult at this point. Also Check out... When was the earliest account of a christmas tree? 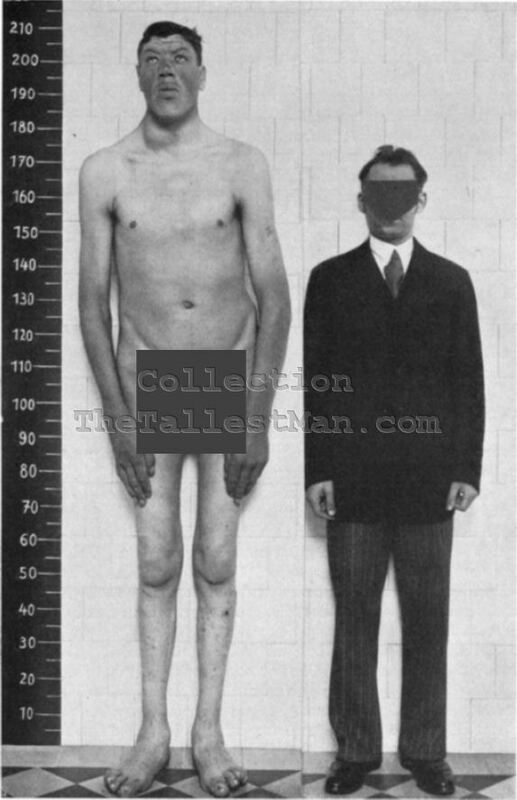 Between 25 August 1930 and 23 May 1931 Adam Rainer was examined by Dr. A. Mandl and Dr. F. Windholz and found to be 7 feet 1 inches (216 cm) tall with a standing height of 6 feet 9.1 inches (206 cm). During these examinations a pituitary gland tumor was found, causing an overproduction of growth hormone. Rainer suffered from acromegaly and showed many outward signs of acromegaly; abnormally large hands and feet, protruding forehead and jaw, thicker lips and teeth that are more widely spaced than normal. It was decided that an operation to remove the tumor would be the best plan of action, although the chance of success would be small because the tumor had been growing for 10 years already. On 2 December 1930 Adam Rainer was operated by Prof. O. Hirsch. A few months after the operation (20 May 1931) Rainer was measured again. His standing height was the same as the previous measurment 6 feet 9.1 inches (206 cm) but his spinal curvature was more severe, indicating that he was still growing and the operation to halt his growth had failed. When he died in 1950 he had reached a corrected height of 7 feet 8 inches (233.7 cm) or even 7 feet 10 inches (238.8 cm) according to newspaper articles after his death.